When my mind gets set on something, there’s very little that can stop me from running full speed ahead towards the desired end. On some levels this enthusiasm (as I like to call it…) is a wonderful attribute. I can attack a to-do list like nobody’s business and I my goals get accomplished most of the time. However, my so called enthusiasm can turn into impatience all too quickly and that doesn’t serve me well. My enthusiasm and impatience has led to some serious circumstance manipulation. I have a picture of what I’d like to happen and I will do anything within my power to see that picture realized in full color. God’s will is often forsaken or just plain forgotten when I get that bee in my bonnet about something – not a good practice for the life, fully submitted to God’s plan, that I actually want to lead. 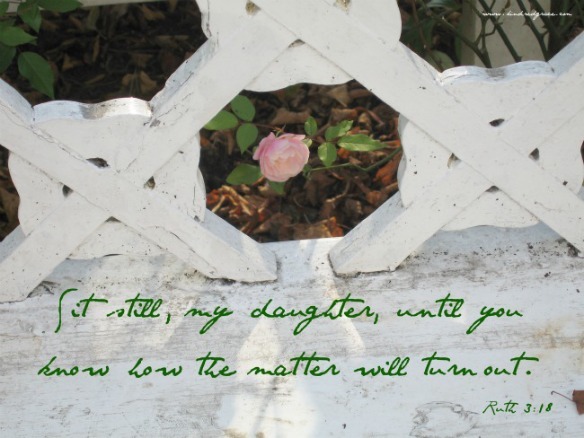 On a recent rereading of Ruth, one little phrase jumped out and spoke directly to my tendency to trample God’s will in favor of my own desires. I’m over on Kindred Grace today, explaining this one little phrase. I hope you’ll pop over and let me know if you can relate! I was a Valentine’s Day hater. Growing up, I never had a sweetheart/boyfriend/date and I developed quite the callused skin towards this holiday that celebrated what I lacked. Valentine’s Day wasn’t devoid of joy – my mom always made a red dinner, which meant we got to have Cherry 7-Up – but I sorely missed those lovey dovey feelings associated with February 14th. I quickly overlooked the eternal source of everlasting love in favor of pining after an earthly relationship. If only someone would ask me out or bring me flowers or write me a sweet note. My if only’s distracted me from someone who was wanting and willing to profess his undying love and adoration. Tim and I are celebrating our first married Valentine’s Day this year. It’s full of love, but I still ache to remember the years past. I’m still learning to find value in Christ not in other people. I’m still learning to feel like a beautiful, handcrafted woman. I’m still learning to accept God’s unswerving love. In an effort to remind myself of the primitive road my love life has been and the hope I have in Christ for the future of my love life with Tim, I wrote a valentine. It’s from God to me. It’s from God to you. Like me, you may have passed the life stage found in this love note, but may the sentiment be an encouragement to you, right where you are. Maybe this will prompt prayers for others on the journey. Maybe this will elicit prayers for yourself. 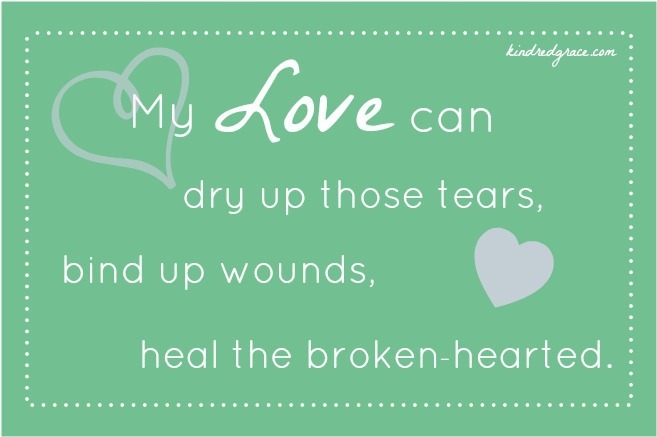 Either way, let God’s love deeply penetrate your heart and may His love fill your cup tomorrow. The valentine is published on Kindred Grace. Read it here. 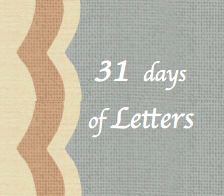 As part of my 31 Days of Letter series last month, I wrote a letter to high school ladies about being patient while God orchestrates their love life. However, the encouragement to wait for God’s timing isn’t limited to highschoolers and waiting doesn’t only apply to romantic relationships. 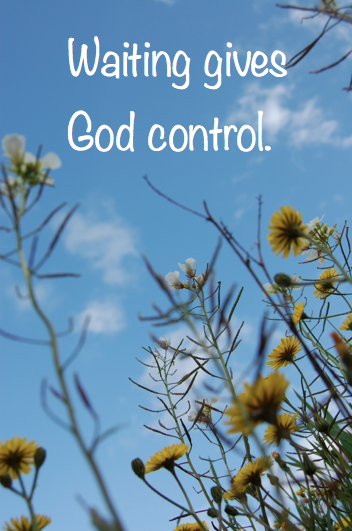 My romantic history taught me the importance of giving God control of my desires. I’m still learning. I seek to be open-handed with my plans so that God can change them, replace them, or completely erase them at His will not mine. I got an email from one of my favorite high school ladies with a great question that I wanted to answer here in case others had similar ponderings. Sometimes when I am waiting for something I do get distracted on the thing I want. Any sugestions as to how I might try to be more focused on God?? I definitely failed more than I succeeded in this department. In hindsight, I do know what I wish I would have done more often to combat that antsy, agitated state of waiting. The key is to distract yourself from being distracted. Confusing? Aren’t you trying to avoid distraction? Well, yes. But, the effectiveness of this strategy is WHAT you distract yourself with. Distract yourself with God and you’ll be well on your way to being more focused on Him. Pray – Cry to God. Yell at God. Confess to God. Ask questions of God. Thank God. Submit to God. I found it very therapeutic to be honest with the One who knows my heart more intimately than I do. Praying may not yield a change in your circumstances, but growing intimacy with God changes your attitude about your circumstances. The best way to foster intimacy is to communicate. Listen – I always rebelled against this step in the process. I listened – I just listened to the wrong voices. My heart and mind were rowdy with hurt and frustration. Those voices weren’t helpful, but they were a way to justify my feelings. Listening to God required silence, which is the antithesis of what I wanted to accompany my waiting. Silence made the wait seem stark and never-ending. Learn to be still in order to hear the still small voice of God. Quieting my heart and mind made space for me to accept God’s comfort and peace. Serve – Pour into others. Waiting can become really internally focused. Selfishness is one of the most destructive qualities in relationships. It’s best to start weeding that out of your life ASAP. Being active for God’s glory is a great way to start making selflessness a habit. No matter how much you want to be in a relationship, the “single season” should not be wished away. I missed out on deepening friendships and creating richer community because I was focused on what I didn’t have instead of the gifts God had already provided. I also let my single status slip away without maximizing the time I had, for lack of a less cliche phrase, to better myself. I could have given Tim the gift of a more patient, kind, selfless wife. Bottom line: Get distracted by God, not the difficulty of waiting. Enjoy the single season – you most likely won’t get it back. How do you stay focused on God in the midst of waiting? Waiting is wretched. I get it. I’ve waited for a lot of things. Many of them had to do with guys – or lack thereof. I waited for someone to ask me to dance at 8th grade promotion. I waited with baited breath for my 7-year crush to IM me. I waited for a date to Homecoming. I waited for tryout results. I waited for a guy to seem interested. I waited for a date to Prom. I waited for a boyfriend. Many of those things never materialized. Actually, most of those things never happened. That crush did IM me and I did make some teams, but I didn’t get asked to any dances and I spent 24 years boyfriendless. Those times of waiting with no results were a major knock to my womanly pride. I cried. I filled pages in my journal with prayers and pleas and pain. Before you feel sorry for my dateless, crushless high school existence, let me say that God absolutely knew what He was doing when He withheld what I wanted and waited for. I made sincere commitments about purity and set high standards. In my naiveté, I didn’t realize how small I was making my pool of acceptable guys. My infatuations were far from meeting my requirements (yup, I had a written list and highly recommend doing so!). While I spent mental and emotional energy trying to 1. smoosh my current crush into the box created by my standards, 2. manipulate circumstances to fit my personal agenda, or 3. figure out why none of it was working out, God was perfectly orchestrating His plan like only a master conductor could. God was using the absence of what I desired to mold me more into the Godly woman I also wanted to become. He arranged my romantic life in a way that guarded my convictions and boundaries, when I probably wasn’t willing to guard them myself. Your romantic situation, or lack thereof, may seem depressing. You may wonder if a guy will ever like you. You may be dating up a storm, but, for what purpose? Wherever you’re at on the spectrum, waiting isn’t a bad thing. Waiting gives God control. Waiting says God can pick the timing. God’s timing will be different for everyone. Waiting is hard, but don’t let the difficulty of waiting distract you from pursuing God whole heartedly. I realized, after writing you that previous letter, I had much more to say. I could write an advice dictionary to you, with all of my words-to-the-wise in alphabetical order and explained in detail. Though that would appeal to my type A personality, I think even my younger self would rebel against such blatant superiority. Superiority is far from what I’m trying to communicate with any advice I give you. Sure, you make mistakes, but believe me when I say, you continue to make mistakes as you grow older and “wiser.” However, in 25 years, I’ve begun to recognize a pattern in your mistakes and struggles. You have an insatiable desire to do everything right and do it right the first time around. There’s a danger in this striving for perfection that has made your journey seem more primitive than it needs to be. You desperately seek God’s will and His direction for your life, but you focus on the minutia of His answer. I’ve learned over the past 25 years that God’s still small voice likes to communicate the big picture. Maybe that mode of communication is unique to us because God knows we spend too much time fixating on details. Regardless, after years of burdened prayers asking God to reveal His will, that still small voice led me to a verse that becomes our hearts cry over and over again. I’d like to make you privy to this knowledge a little earlier in hopes that you can avoid some tears and confusion. It’s quite simple, really. There are three things that always comprise God’s will for you: joy, prayer, and gratitude. 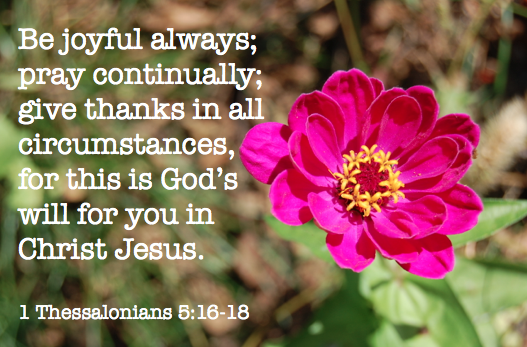 Joy, constant prayer, and giving thanks are always God’s will. The surest way to do the right thing the first time is to be joyful in any circumstance, steep your decisions in prayer, and give praise to God for the outcome. My dear Em, even in their simplicity, all three are difficult to do without God’s strength and grace. You won’t always choose to be joyful or choose prayer before action or choose to give thanks. But, devote yourself to these disciplines. Pursuing them, even when you fail, is always more fruitful than striving after your own plans and purposes.